We lift weights to build strong muscles. We eat fiber-rich foods for good digestive health. We try to get enough sleep to help the body rejuvenate. But what are you doing to maintain optimal joint health? If you hesitate to answer, you are not alone. We tend to neglect joint health as we focus on other things. But our joints allow us to move and be productive – so if they begin to fail, everything else will follow. That is why today is a great time to start focusing on maintaining or improving the health of your joints. How Can I Keep My Joints Strong? A good deal of joint pain can be traced to overuse or misuse. Therefore, until you learn proper techniques of your sport or your occupation, the repetition of incorrect movements in the joints will only make the pain worse. 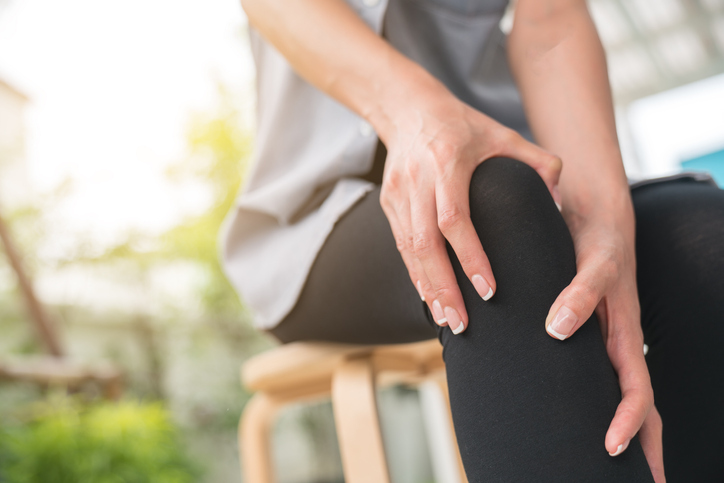 If your joint pain comes from wear and tear – which causes arthritis – or any other overuse syndrome, seek out an expert’s advice as to how to improve your swing, stroke, gait, or technique. Once you re-learn your activity the correct way, you should notice a reduction in pain, and improvement in your performance. Believe it or not, certain foods can either be beneficial or detrimental to joint health. Try to avoid salty or processed foods. Reach for the leafy green vegetables, calcium-rich foods, and foods that are high in vitamins A, D, and C.
A colorful diet of natural, whole foods – including foods that are high in omega fatty acids and whole grains – are what your joints need in order to stay healthy and strong. And while you’re at it, cut back on caffeine and alcohol, and avoid smoking altogether. Your joints will thank you. Getting enough of the vital vitamins and minerals in your daily diet isn’t easy, so many people supplement their diet with vitamins. Plus, spices like turmeric and ginger – either as an ingredient or in capsule form – contain medicinal properties that can be effective at treating pain and inflammation. It’s best to speak with your doctor before undergoing a new regimen of vitamins and/or supplements, as they could interfere with medications you are currently taking. And, if they are taken in excess (such as consuming too much iron or vitamin C), they could be toxic to your system. Wearing supportive shoes may not be fashionable, but neither is joint pain. Instead of wearing ballet flats or stiletto heels with little to no support, be sure your shoes are comfortable, padded, and supportive to reduce knee and ankle pain. If you have to reach or strain in order to operate machinery or work at your computer, chances are you will soon notice your joints starting to ache. Your best bet is to have your area evaluated to make sure you are not overexerting yourself or straining. Have you ever carried a 30-pound suitcase across a busy terminal? Now imagine carrying around that much extra body weight. With every step you take, the pressure of your body weight is being absorbed by your joints. And with each pound lost, that pressure is relieved. The benefits of losing weight include everything from better heart health to more confidence. So if your joints ache, relieving any pressure will be a welcome solution for your body. When it comes to joint health – especially the knees – low-impact exercises are best. Instead of running or jogging, consider walking, swimming, or low-impact aerobics. This way, you will gain the aerobic benefit but eliminate any threat to your joints. Not sure why your joints are aching? It could be due to anything from arthritis to Lyme disease to diabetes. The only way to know for sure is to visit your doctor for a complete diagnosis. Once the cause of your joint pain is determined, your doctor will work with you to develop a treatment plan. The highly skilled physicians at North Canton’s Spectrum Orthopaedics value the health and wellness of each patient. With world-class orthopedic experts offering state-of-the art MRI technology and an advanced surgical center, our facility houses everything necessary for complete care. If you are suffering from joint pain, visit us for a diagnosis today. We will devise a treatment plan that is right for you. To schedule an appointment, call (330) 305-0838 or (844) 469-2663, or fill out our online appointment request form today. We look forward to helping you live a more pain-free lifestyle.